Rev. 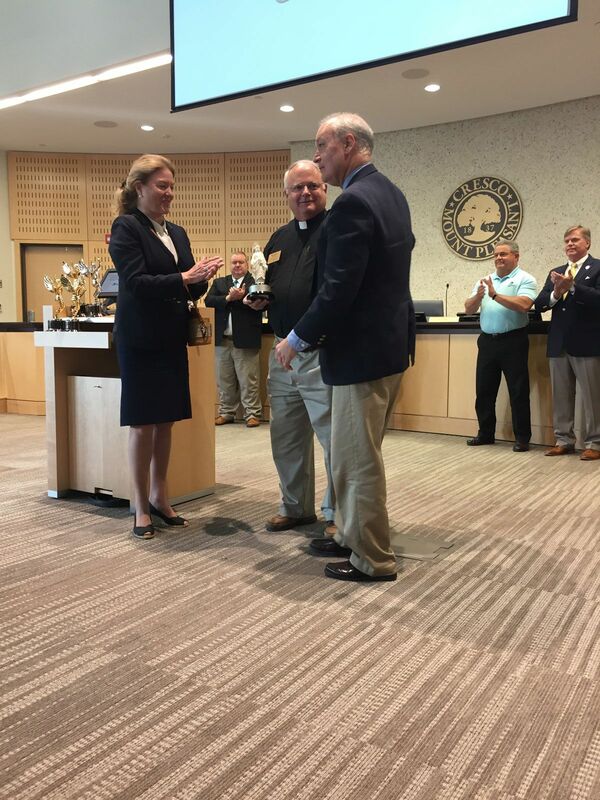 Rob Dewey, the founder of the Lowcountry Community Chaplaincy http://www.lowcountrychaplains.org, was awarded a 2017 ReadyCommunities Partnership www.readycommunities.org National Service Award for Community Ministering in Crisis on May 8, 2018, at the Mt. Pleasant, SC Town Council chambers. Dr. Rosalie J. Wyatt, MBA, president of the Washington, DC-based Corporate Crisis Response Officers Association and national director of its ReadyCommunities Partnership initiative, presented the physical award with Mt. Pleasant, SC Mayor Will Haynie and members of the town council presiding. Rev. Dewey has served his community for nearly three decades by building a nonprofit ministry to provide pastoral care and crisis counseling for victims, responders, and their families. Rev. Dewey envisioned a chaplaincy which other community leaders and stakeholders grew to recognize and would eventually integrate across the Charleston area's response to crises through police, fire and EMS services. Today, he moves forward to develop the Lowcountry Community Chaplaincy to tend to the needs of corporate leaders and employees impacted by natural disaster, attack or other threats. Dr. Wyatt stated that "By recognizing Rob Dewey with a ReadyCommunities Partnership National Service Award, we are also pausing to recognize each of America's responders - whether career, volunteer, or civilian for their invaluable contributions and dedication to community and national resiliency." Rev. Dewey said, "It fills me with joy and purpose to serve my community by ministering to and counseling those in crisis." Since 2006, the ReadyCommunities Partnership has continued the work of the Gilmore Commission by engaging Charleston-area public, private and community stakeholders in a critical mission to reinforce if not augment America's response capacity in the first 72 hours of a large-scale or national crisis through corporate engagement, cross-sector collaboration, and innovation. ReadyCommunities Partnership programs include the National Blueprint for Secure Communities, the National Service and Sacrifice awards and other leadership initiatives in strategic communities with ports and military installations across America. Each recipient of a ReadyCommunities Partnership National Service and Sacrifice Award receives a physical award which is a likeness of the Statue of Freedom atop the U.S. Capitol building with an inscription of the awardee's name and category.